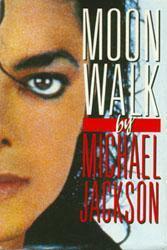 Moon Walk is an autobiography written by American musician Michael Jackson. The book was first published in in 1988, a year after the release of Jackson's Bad album, and named after Jackson's signature dance move of the same name. The book was edited by Jacqueline Kennedy Onassis and reached number one on the New York Times Best Seller list. The title of Moon Walk was derived from Michael Jackson's signature dance move, the moonwalk. The moonwalk presents the illusion that the dancer is stepping forward whilst actually moving backward. The dance move gained widespread popularity after being performed by Jackson on the 1983 television special Motown 25: Yesterday, Today, Forever, and has since become the most well known dance move in the world. The first manuscript of the book was written by Robert Hillburn, which was refused by the publishers, Doubleday, because it lacked "juicy details". A second manuscript was written by Stephen Davis, which Jackson drastically edited. Jackson finally decided to write the book himself, with help from Shaye Ayrehart (although there were reports that Ayrehart later quit after Jackson threw a snake at her). Jacqueline Kennedy Onassis edited the book and wrote a three paragraph introduction.